What makes Earth the perfect home for life as we know it? Students in this activity explore the orbital characteristics a planetary home needs to support Earth-like life forms. The “Goldilocks Phenomenon” loosely defines the major characteristics a planet needs to potentially support life: having just the right temperature and type of star, orbiting at just the right distance, and with just the right gravity, rotation, and chemistry. The activities in this lesson explore these characteristics by having students brainstorm and manipulate ideal life conditions, explore stellar types, define the "zone of habitability," and develop an understanding of critical planetary mass to determine which newly discovered planets might be capable of supporting life. Students start by evaluating which variables in Goldilock’s adventure were important in selecting the items that were “just right” and then use similar strategies to prioritize extra-solar planet characteristics for the possibility of harboring life. In the end, students create an imaginary habitable world which meets important criteria for an Interstellar Real Estate market. For this activity you will need to recall the story of “Goldilocks and the Three Bears”. In the story, Goldilocks is faced with several choices during her time in the Bears’ home. A. Consider the information given in the table below and answer the following question. i. Whose bowl of porridge did Goldilocks choose? ii What characteristic about the porridge did Goldilocks use to decide which bowl was “just right”? B. Consider the information given in the table below and answer the following questions. i. Which chair did Goldilocks choose? ii. What characteristic about the chairs did Goldilocks use to decide which one was “just right”? C. Consider the information given in the table below and answer the following questions. i. Which bed did Goldilocks choose? ii. What characteristic about the beds did Goldilocks use to decide which one was “just right”? D. If the diameter of Papa Bear’s Bowl had only been 10 cm, would your answers in part A change? If so, how? If not, why not? E. If Mama Bear’s chair was made out of plastic rather than wood, would your answers in part B change? If so, how? If not, why not? F. If Papa Bear’s bed was 12 cm tall, would your answers in part C change? If so, how? If not, why not? G. If the height of Mama Bear’s chair was 38 cm, would your answers in part B change? If so, how? If not, why not? I. If Mama Bear had a medium stiffness mattress, would your answers in part C change? If so, how? If not, why not? Activity #2 Why Is There Abundant Life On Earth? Examine the information provided in the table below and answer the following questions. Note: 0.8MEarth means that the planet has a mass that is 80% the mass of Earth. A. Which of the characteristics listed in the table allow life to flourish on Earth but not Venus and Mars? Explain your reasoning. B. Describe how the characteristics identified in part A would change if the following changes were made. i. The Earth was moved closer to the Sun. ii. The Earth was moved farther from the Sun. iii. The Sun’s temperature was much hotter and it was much larger. iv. The Sun’s temperature was much cooler and it was much smaller. The planets in our Solar System orbit the Sun at very different distances. Scientists have developed a system for describing distances in our Solar System based on the average distance between the Earth and the Sun. The Astronomical Unit (AU) is approximately 149,570,000 kilometers (the average Sun-Earth distance). The distances between objects in our Solar System are measured using the AU as the common unit of distance. The table below provides the planet’s name and average orbital distance to the Sun. A. Convert the distances from km to AU for each of the planets in our Solar System. B. Construct a scale model of our Solar System. Mark a large dot to represent the Sun at one end of your scale model. Then place dots at the correctly scaled distances away from the sun to represent each of the nine planets. Your teacher will have further instructions on how to complete this activity. The presence of liquid water at the surface of a planet appears to be one of the central characteristic that distinguishes whether or not a planet can harbor life. This requires that the planet be at a distance from the central star where the temperature is not too low to cause all water to freeze nor too high to cause all water to boil. The region around a star where the temperature is “just right” is known as the “zone of habitability.” For a star like our Sun the zone of habitability has been identified as between .84 AU and 1.7 AU. C. Mark the zone of habitability on your Solar System scale model. D. Which of the planets in our Solar System may have the potential for liquid water on the surface. Explain how you can tell. E. Is the Moon in the zone of habitability? Does the Moon have liquid water on the surface? Why, or why not? F. Describe how the location of the zone of habitability would change if the central star’s temperature was to increased. Activity #4 The Sun Is A Star? A. Obtain a set of “Star Cards” from your teacher. Examine each star card and using the information provided sort the stars by their distance from the Earth, from largest to smallest. B. Does the star’s temperature appear to depend on the distance from the Earth? C. Compare the color of the star to its temperature. Compare the spectral class of the star to its temperature. Do the color or spectral class of the star appear to be related to the star's temperature? D. Sort your star cards by temperature, from coolest to hottest. E. Consider the four characteristics (1) Temperature, (2) color, (3) distance, and (4) class or spectral type. Which characteristics most strongly influence the size and location of the habitable zone? Explain your reasoning for each. F. If we are looking for Earth-like life elsewhere in the universe, which of the stars described on the star cards would you explore first? What spectral classes did you choose? Explain the reasoning behind your choices. Scientists believe that life as we know it is most likely to exist around stars most like our Sun, in the F, G and K classes. Size, temperature and light appear to be important factors in identifying these stars. G. How would the zone of habitability be different around an "F" star, or a "K" star as compared to the Sun? Explain your reasoning. Activity #5 Size and Mass are Important! Up to this point we have identified that the “just right” condition for life is the presence of liquid water on a planet’s surface. This suggests we should first search for a planet that rests in orbit around a Sun-like star (classes F, G or K) within the star’s zone of habitability. In addition to the distance from the star, the planet must also have a suitable atmosphere. This requires that the planet has a mass between 0.5 and 10 Earth masses, with a radius between 0.8 and 2.2 times that of Earth. Planets that are too small will not have enough gravity to hold an atmosphere, and larger planets will have an atmosphere too thick to support life as we know it. For example, photosynthesis cannot occur if the atmosphere is impenetrable, or a runaway greenhouse effect could occur such as on Venus today. A habitable planet would also need to have the right type of atmospheric chemistry. Nitrogen, carbon dioxide and oxygen would likely need to be present in amounts similar to what is found on Earth. . The (primary) star is classified by its spectral type. The planet mass is provided in multiples of the mass of Jupiter which is 317 times more massive than Earth. The distance from the star to the planet is shown in AU. For example the table shows that the star named HD 16141 is a G –type star. The orbiting planet has a mass of .215 times the mass of Jupiter or about 68.2 times the mass of Earth. We also find that the planet is located .35 AU from the star. A. Examine the first 6 planets in the table. In the space below, list the star name and state whether or not the companion planet can support Earth-like life. 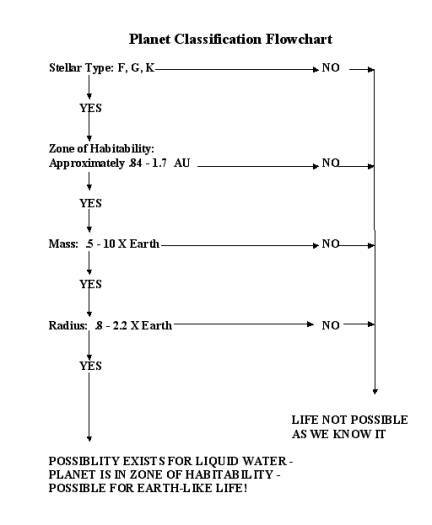 To assist you in making this determination use the “Planet Classification Flowchart” provided on the next page. For planets that fail the test, state the major factors that keep them from being candidates for Earth-like life. B. Could any of the planets you have listed have an orbiting Earth-like moon that could support life? List any possible candidates and explain your reasoning for each. One of the planets you propose must be able to support Earth-like life and the other must not, but could possibly have a moon that could support life. Advertisements should include a picture and provided detailed information in a way that makes their planet desirable for prospective buyers. This can be created using posters, pamphlets, or web pages according to the specifications provided by the teacher. Once all the planet advertisements have been created, each student group should generate a list of all the possible new locations for Earth-like life.